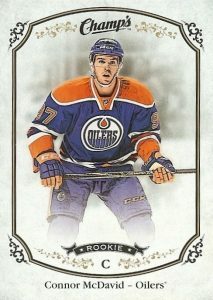 One of the most anticipated names in hockey for several years, collectors finally got their wish as "The Next One" made his official NHL debut and Connor McDavid rookie cards soon followed. 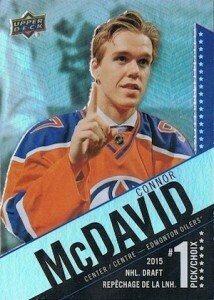 Although just a teenager at the time, many appointed McDavid as the budding king of the hobby and his cards have only increased in popularity. 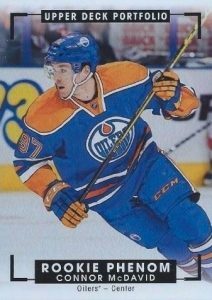 In the long run, Connor McDavid rookie cards have the potential to not only be the biggest from 2015-16, but in all of card collecting. Coming as no surprise, the Edmonton Oilers made Connor McDavid the first overall pick of the 2015 NHL Draft. While his official rookie cards were limited until the midway point in the season, many early cards were already available. 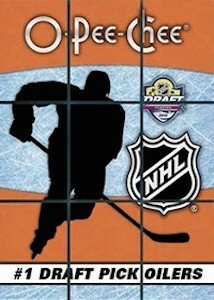 Check out the key cards that pre-date his NHL career in our detailed prospect and pre-rookie guide. 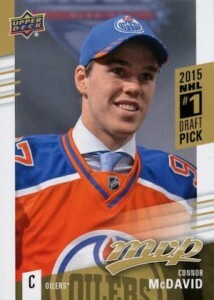 Shop for 2015-16 Connor McDavid Rookie Cards on eBay. 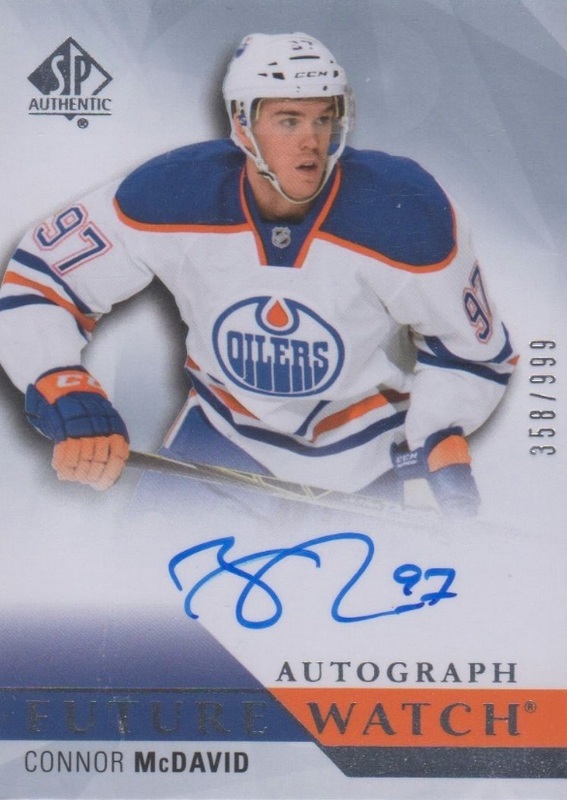 Although Upper Deck holds the sole rights for NHL cards, the card company removed any doubt regarding McDavid's autograph cards with an exclusive agreement that makes UD the only place to find his signed cardboard going forward. They later added an autographed memorabilia exclusive. Upper Deck also released a special commemorative product that is dedicated just to the young star: 2015-16 Upper Deck Connor McDavid Collection. Despite a strong start, his rookie year was somewhat derailed by an injury that resulted in surgery and missed time. While it ultimately hurt his Calder chances, the missed playing time did not slow collecting interest and he is still the jewel of the 2015-16 rookie class. McDavid followed that up with the Hart Trophy as the NHL MVP in 2016-17 and won the Ted Lindsay Award as the most outstanding NHL player in 2016-17 and 2017-18. 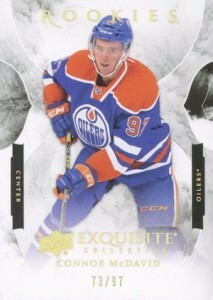 The full checklist of Connor McDavid rookie cards can be seen below. 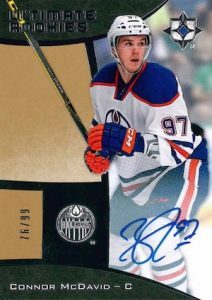 The first live, pack-pulled NHL card for McDavid is found in 2015-16 Upper Deck Series 1 Hockey, with many more after that. Click on the listings or images to shop for cards on eBay. Bolded set links go directly to product profiles and checklists. 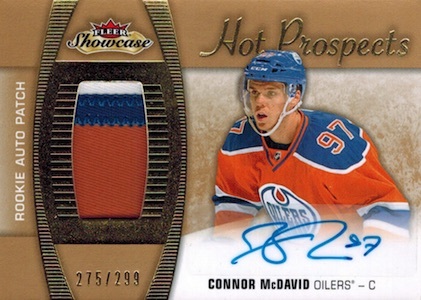 In addition to a bevy of 1990s-themed inserts like Precious Metal Gems, 2015-16 Fleer Showcase offers an intriguing autographed patch for Connor McDavid rookie collectors. At 299 copies, the RC is rare but still plentiful enough to keep values from going crazy. While the sticker autograph is not preferred, the design does a solid job of incorporating it and the moderate jersey patch gives it more appeal. An early Connor McDavid option that received a lot of attention, the #1 Draft Pick card in 2015-16 OPC took some extra work. Collectors had to track down all nine pieces of the puzzle from packs of OPC and send it into Upper Deck. With overall odds of 1:104 packs, this was not the easiest set to make. Capped at only 97 copies, the promotion filled fairly quickly. 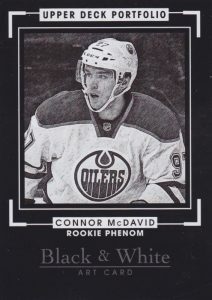 Although he missed out on the main OPC set earlier in the year, collectors can get their Connor McDavid O-Pee-Chee fix with a splash of chromium. The on-card 2015-16 OPC Platinum autograph comes in a variety of parallels of varying colors and rarity. Although the base card is not numbered, Upper Deck has revealed that he is part of the Group C signers that average 1:704 packs. One of the most plentiful numbered autographs for McDavid, 2015-16 SP Authentic carries a strong tradition with collectors. In addition to the base Future Watch Autograph for McDavid, there is also an autographed patch version that is numbered to 100 copies. 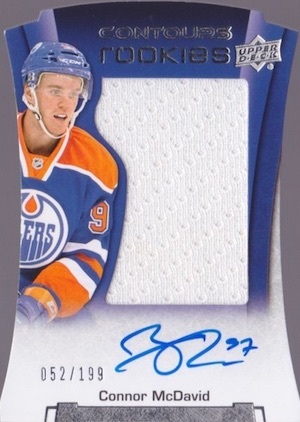 Despite not offering anything extra, like an autograph or relic, the 2015-16 SP Game Used rookie for McDavid will go down as one of his rarest at just 97 copies. There are also several relic parallels that are easier to track down. The design might not be for everyone and the tiny jersey pieces really don't add much, but 2015-16 SPx certainly has its share of fans. 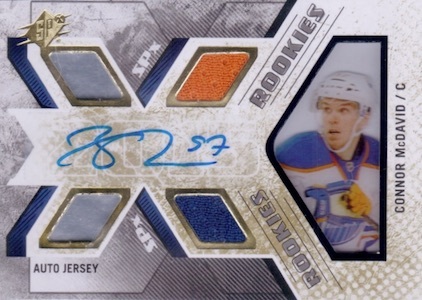 The slightly higher print run makes it one of the most common autograph jersey cards among the Connor McDavid rookies. Loaded with foil and an especially striking look thanks to the silver signature, 2015-16 UD Black gives collectors another on-card autograph for McDavid. Limited inserts in the product offer gold ink signatures. 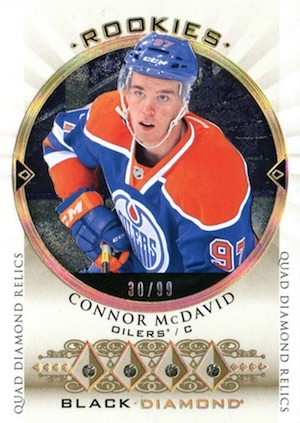 While the segmented boxes make for an odd design, the Ultimate name still helps carry strong interest for this Connor McDavid rookie card. 2015-16 Ultimate Collection includes a base autograph, a relic-only version and a limited autographed relic. 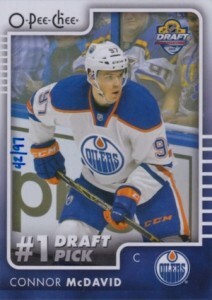 The first official rookie card for Connor McDavid is available in UD Series 1 and is still his top overall choice for many collectors. The Young Guns line has emerged as the go-to base rookie cards for hockey fans, and this card has been eagerly anticipated since he was taken with the first pick in the 2015 NHL Draft. 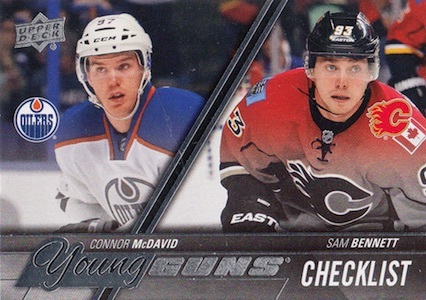 In addition to several YG parallels, McDavid is included alongside Sam Bennett on the Young Guns checklist card (#250). 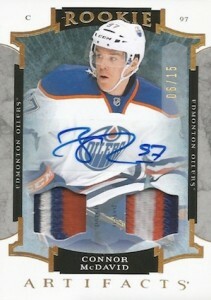 Collectors looking for McDavid's Canvas card need to check out Series 2. 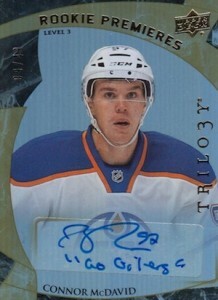 Series 2 is also home to his OPC Update rookie card. Signed buybacks (hand-numbered to 97) came in 2017-18 SP Authentic. 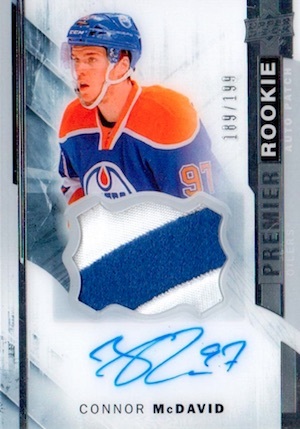 The most popular and plentiful of the Connor McDavid rookie redemptions, 2015-16 Artifacts includes a base version and several premium choices. 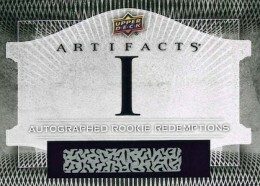 The Roman numeral (#I) redemptions are found as relics, autographs, or autograph relics. Featuring a quartet of actual diamonds, 2015-16 Black Diamond should remain one of the higher-end rookie options for McDavid despite not adding his signature. A print run of just 99 virtually guarantees strong values for the foreseeable future. 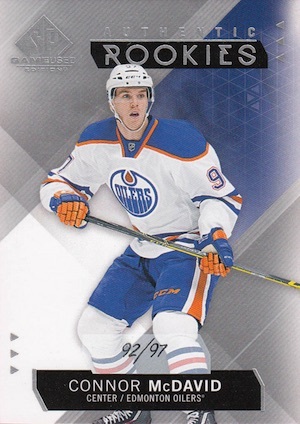 Rebooting a former brand, 2015-16 Upper Deck Champ's includes a pair of Connor McDavid short prints in the base set. Part of a 45-card group that falls 1:5 packs, card #315 has him looking ahead. Much more difficult to find is #321, which shows McDavid looking to the side. This Rare Rookies subset card averages 1:600 packs across the six subjects. Found amongst a mix of hockey stars and celebrity fans, the Connor McDavid rookie is still the main draw in 2015-16 Contours. The die-cut design makes for a non-traditional look, but the on-card signature, large patch and rarity keep it higher on the collecting radar. A limited Gold Patch parallel brings that total down to 35 copies. 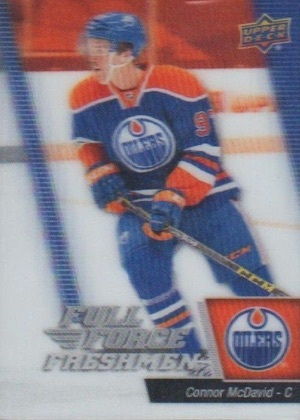 Part of the Full Force Freshmen subset, the 3D rookie for Connor McDavid is a unique option for collectors as lenticular cards are not normally used as official rookies. The card is found in the debut 2015-16 UD Full Force product that emphasizes inserts and various card technologies reminiscent of the hobby in the 1990s. Given the 23-card checklist and overall hobby odds of 1:18 packs, these are no easy pull. 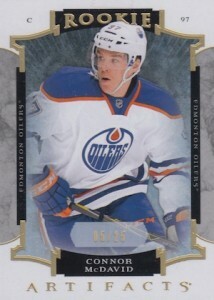 There is also a large variety of other inserts for McDavid, including foil, acetate and die-cuts. 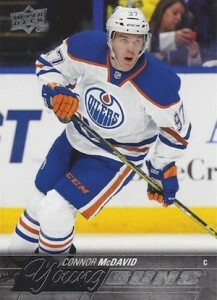 It may not have an autograph, relic, or even a diamond, but the 2015-16 Upper Deck Ice rookie card for Connor McDavid does have a very limited print run of 99 in addition to acetate stock. There is a signed version that is slightly more plentiful at 125 copies. 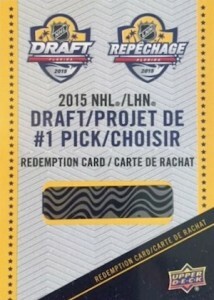 This redemption from 2015-16 MVP Hockey offers collectors the very first chance at a Connor McDavid rookie card pulled from a standard set. 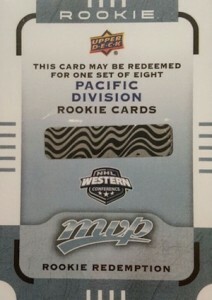 While it is not ideal for collectors to have to wait, this rare card holds a special place for many collectors. 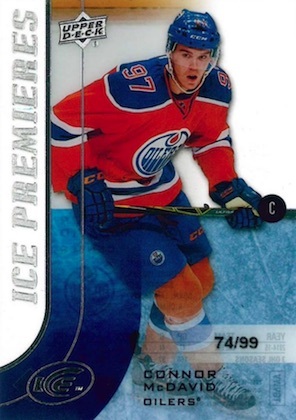 The Connor McDavid redemption card is a tough pull at 1:960 hobby packs or 1:9,600 retail/blaster packs. There is also a signed version that is much more elusive at 1:10,250 hobby packs. 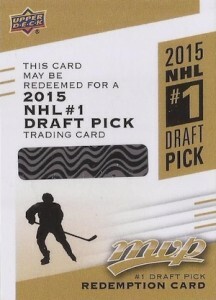 Another McDavid rookie redemption in MVP, this card comes as part of the eight-card set that also includes Max Domi. Giving collectors considerable base variety, 2015-16 Upper Deck Portfolio features four different Connor McDavid rookie cards. The color Rookie Phenom is the most common while the Black & White Art Card is the rarest. Combining acetate with an on-card signature and jersey swatch, 2015-16 Upper Deck Premier is anything but simple. Limited to 199 copies, there are a few parallels that push that number much lower. The pinnacle of high-end rookie cards, The Cup needs no introduction. When you add the most celebrated rookie in years to the most valuable set each season, huge sales follow 2015-16 UD The Cup. 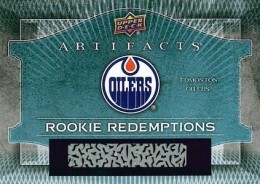 This rare redemption option for McDavid is found in the insanely popular Tim Hortons promotional set. At 1:16,470 packs, these are quite tough to hit. 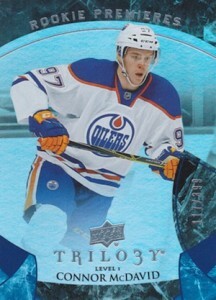 Collectors are treated to multiple Connor McDavid rookie card tiers and rarities in 2015-16 Trilogy. In addition to the base Level 1 Rookie Premieres version that is numbered to 999, collectors can find two different signed cards for McDavid (Uncommon and Rare) and a triple signature that also includes sticker autographs for Max Domi and Dylan Larkin. 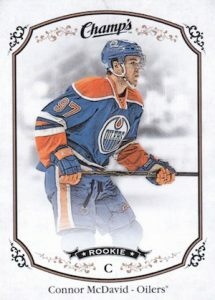 While it was issued as an insert in 2015-16 Black Diamond, the Exquisite Collection rookie cards for McDavid still sees considerable interest and value. The Jersey version is more common with 199 copies and there is a base Gold Spectrum option that is limited to 97. 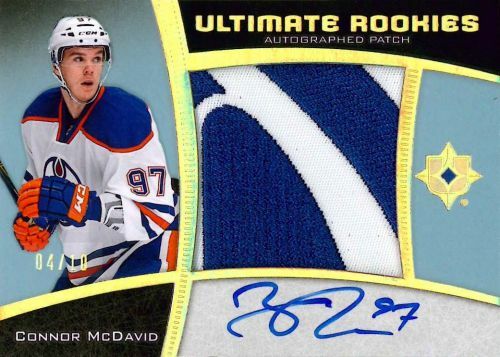 McDavid also has more Exquisite cards in 2015-16 UD Ice, including the base card under the brand (#/299) and 2003-04 Exquisite Tribute Autographed Patch. Re: the Tim Hortons Connor McDavid Rookie Redemption card. The odds of pulling one is tough, 1:16,470 packs, but with 8,235,200 packs being produced (minimum) that works out to about 500 of the redemption cards. 8,235,200 / 16,470 = 500. Hi I pulled a McDavid sp 1 how rare is it . I saw the 1:4000 hobby pack ratios but how many were printed is there any way to estimate. Do manufacturers release this info? Also great website I really enjoy reading the articles. I just bought 1doubke pack of upper deck and no cards even though the description said three inserts/onley card i pulled other then commen was conner’s young gun!!!!! Lol yessa!!!! I pulled the Connor McDavid 2015-16 SP Games used card #97 out of 97. It is signed but I don’t see any other cards in this run signed… why is that? Does that make my cards rare and valuable? 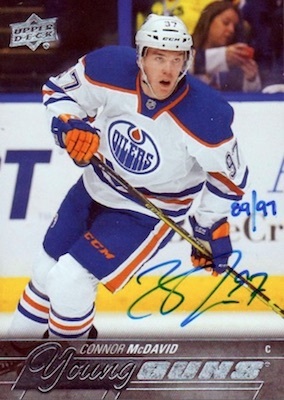 Pat Farley � At this point, any signed card for McDavid is valuable. 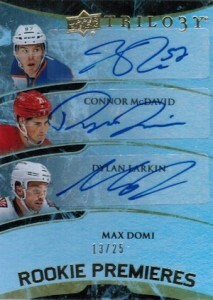 As noted in our SP Game Used profile (https://www.cardboardconnection.com/2015-sp-game-hockey-cards), the final card in each of the base print runs is signed. This means there is only one signed rookie card for McDavid in SP Game Used so that card is incredibly rare and arguably the best card in the entire product. 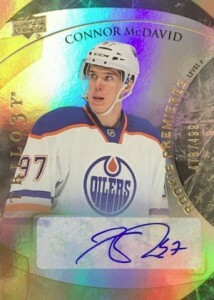 I just pulled a Connor McDavid autographed rookie relic redemptions emerald artifacts card. I can’t find anything about how valuable it is anywhere. Could anyone give me an idea of what it’s worth? 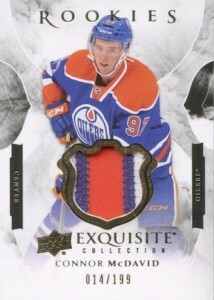 The McDavid P.O.E canvas in Series 2 is a good one too. I got it in an e-pack. My problem with Upper Deck is that they are seemingly phasing out most of their low end products and the ability for collectors to get low end rookie cards in favor of their more expensive short print or autographed rookie cards. I refuse to shell out hundreds if not thousands of dollars on packs of cards or singles I want. Gone are Victory and Collector Choice where for a reasonable price you could pull actual rookie card without taking out a second mortgage. MVP and OPC are considered low end product but they still expect you to find ultra limited redemptions or short print autographed cards for the big name rookies. 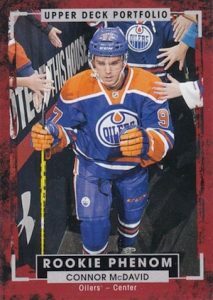 Sure you can get the Regular OPC Marquee or OPC Platinum Marquee rookie cards of players like McDavid but many collectors don’t consider them actual rookie cards because Upper Deck has decided to put those cards separate in a subset. 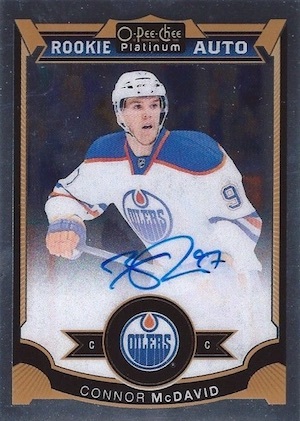 Any idea what a 2015-16 OPC Platinum Retro rookies Connor McDavid R97 OILERS autographed is worth? is it rare? Hey Pat, I see you pulled the Mcdavid SP Game Used 97/97! 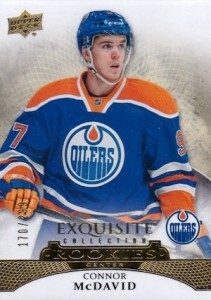 You have Mcdavid’s rarest true rookie card! SP Game Used offered the smallest true rookie print run ( only 97 ) of any product and only yours is signed and comes with a COA. Your card is also a jersey number card! Upper Deck’s product literature describes your card as a 1/1 ( even though technically it’s not). 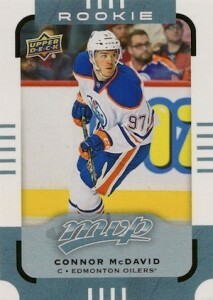 If I could only have just one McDavid rookie card it would be your 97/97 SP Game Used. A collector would probably give you just about anything you asked for it. Congratulations! For those everyday collectors on a budget there are only two affordable choices for McDavid rookies which are the Upper Deck Overtime Rookie card not listed on here or the Portfolio Rookie Phenom card. 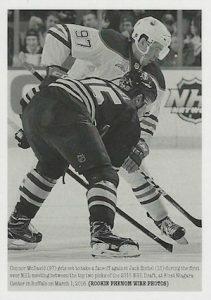 OPC put most of their top name rookie cards in a subset which certain collectors will not recognize as actual rookie cards even though they are the only cards of that player in the entire set. 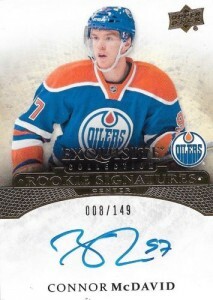 For OPC platinum the short printed autographs are the actual rookie cards while the regular rookies are in the subset. for Platinum at least I understand why the regular cards are not considered rookies but don’t understand the reasoning for the regular OPC release update cards not being considered true rookies. 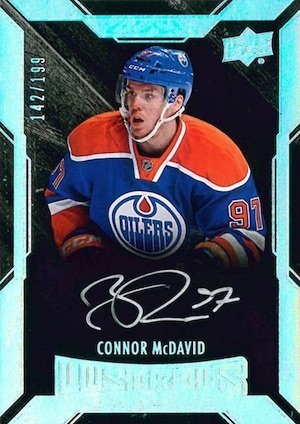 Any idea on what it would take to acquire the entire set of the “2015-16 Upper Deck The Cup Connor McDavid #Cup-197 Rookie Auto Patch Masterpieces” consisting of all four printing plates, i.e., Black, Cyan, Magenta, and Yellow? I don’t believe that they are even listed on Beckett. I imagine it would take quite a lot. Appreciate your prompt response, Trey. 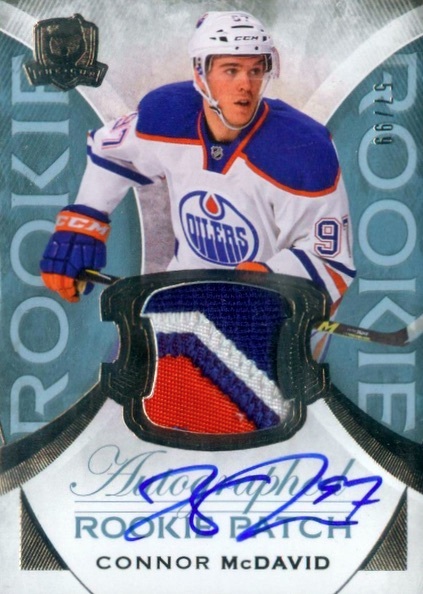 Hypothetically speaking, would you trade a marginally low-grade (e.g., BGS 8.5) “2015-16 Upper Deck The Cup Connor McDavid #197 Rookie Auto Patch” /99 Rookie Card plus $5,000 for the entire set (Black, Cyan, Magenta, and Yellow) of the “2015-16 Upper Deck The Cup Connor McDavid #Cup-197 Rookie Auto Patch Masterpieces” in the highly-unlikely event that someone were able to beat the near-impossible odds of assembling all four printing plates simultaneously in the future? I don’t care for plates so I’d keep the RPA just based on that. 2015-16 UD PREMIER CONNOR McDAVID ROOKIE AUTO PATCH 164 199 NICE PATCH!! !